16 daye of Marche in the yeare of our Lorde God 1597.
livynge Walter, Christopher, and Elizabeth. Probate on Thomas Earle's Will was granted on 12th November 1597 and a copy is available from the National Archives. 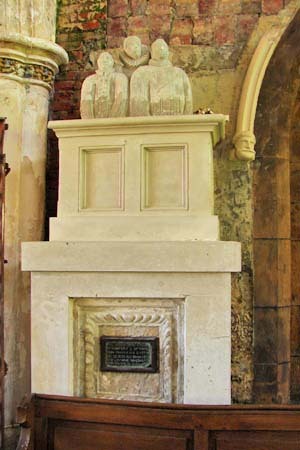 I have not seen this but he is said to have died in possession of the manors of East and West Morden, land in Litchet Matravers, Wareham, Sturminster Marshal, County Dorset, the manor of Charborough, Dorset, the manor rectory and advowson of Axmouth, Devon and lands in Bindon Axmouth, Colyford and Colyton, Devon. The Christopher referred to in this inscription is of course the subject of this short biography, but his brother Sir Walter Earle also invested in the Dorchester Company as did the husband of his sister Elizabeth who was wife to Sir Richard STRODE in Devon. From University records we know Christopher EARLE was born c1590 in Sturminster Marshall. I cannot locate why he would have been born in Sturminster Marshall as opposed to Charborough but this is repeated in the 'History of Commoners' so I have to assume it it correct. Unfortunately the parish registers and Bishops Transcripts for Sturminster Marshall have not survived for that period although a family of this stature may have had their children privately baptised anyway. Christopher was educated at Christ Church college Oxford where he matriculated on 10 January 1608 at the age of 18. From university he entered the Middle Temple in 1617 to become a barrister at law. He married Elizabeth the daughter of Edward DENNY of Stortford on 26 April 1623 ar Birchanger in Essex. A deed relating to the Manor of Sturminster Marshall dated 1622/3 exists at the National Archives which refers to the transfer of a farm as a part of her marriage settlement. They had at least one son also called Christopher born in 1624 as he is mentioned in the Oxford Alumni as " Created DCL 9 September 1651 and MP for Essex in 1653. Along with his brother Sir Walter ERLE he was friends with the Rev John White, sharing his puritan ideals. Both brothers were issued shares in the Virginia Company in 1620 and both invested in the Dorchester Company. He went on to hold many civic posts in Dorset which included being MP for Weymouth and Melcombe Regis in 1621-2, Lyme Regis in 1623/4, Poole in 1626, and Lyme Regis again in 1628-9. An entry in William Whiteways diary for 5 Feb 1628/9 suggests that he was promised the post of recorder of the borough but at the instigation of the Mayor David Giar a Mr King was chosen instead. According to William Whiteway's diary Christopher Earle died at the relatively young age of 44 on 29 March 1634. 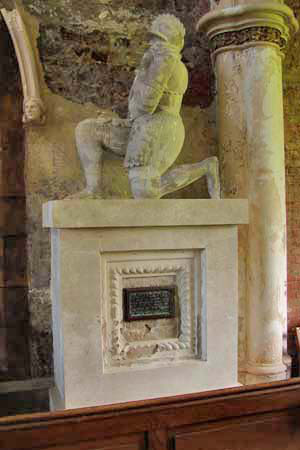 He was buried in the middle aisle of the Temple church in London on 4 Mar 1634. Probate of his will was granted on the 30 May 1634.